There is a modern version of this fabric I am sure. Peacocks and palm trees - how wonderful! 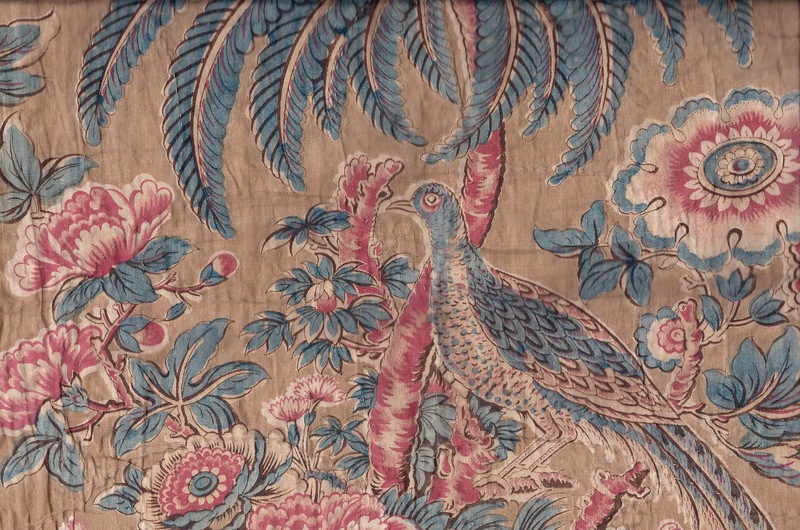 I would leap at a reproduction Chintz like this! (hint hint Margo). Oh, if there is a modern version of this I am going to have a tantrum cos I've missed it...I would give my eye teeth to have something like this. I think 200 years ago there may have been several versions of the partridge. I have seen some designs with a classic partridge body but no tail extension. The retired wildlife biologist husband said 'not an American partridge'. Yes-Probably not American production in 1815. Audubon's first volume of 'Birds of America' was published in London, 1827. Volume #2 was 1838. Both books had a big impart on design for textiles and other applications. 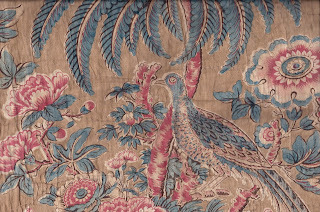 Late last year or early this year a fabric came out with, I think, partridges on it, by Jo Morton. It didn't have the detail or beauty of this one. Like most of us I'd love to see this reproduced. I can just imagine using it as a whole-cloth quilt, its so gorgeous. Four years later, I, too, think it's gorgeous. Has a reproduction of it come out by now?